5-piece including caller. Play 3½ hours with one half-hour break. Recorded music in breaks. Wurlyjig is led by Matt Swindlehurst, who previously led the popular midland ceilidh band Scotch The Rumour until his move to Somerset a few years ago. 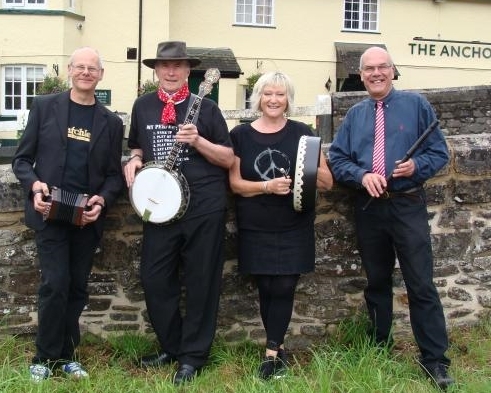 Matt (melodeon) and his wife Lyn (percussion) soon found some like-minded musicians and based in the Exe Valley, in and around Bampton and Dulverton, and Wurlyjig was born. All the musicians have a wealth of experience in playing for audiences of all types and ages, and with their mix of songs and dance tunes from around the British Isles and beyond, they are guaranteed to get everyone up on their feet and dancing. Our quoted price, unless otherwise stated, is for a five-piece line-up including caller, melodeon, guitar/banjo, flute/whistle plus a host of weird and wonderful percussion, on which the guests – especially children – are encouraged to have a go. The band can also reduce down to a four or three-piece. Your guests need no previous experience of barn dancing as Wurlyjig’s caller will happily guide novices through the steps. Wurlyjig will play for up to three-and-a-half hours with only one half-hour break. During the break they can keep the music going by playing recorded music through their PA. For a small additional charge, they are also happy to let you use their PA system to play your own recorded music even later into the night – if you still have the energy! Wurlyjig are based in Somerset. See Pricing for details of travel costs, etc.